It’s the season of giving and goodwill to everyone and we’ve definitely done that in Halewood this December. 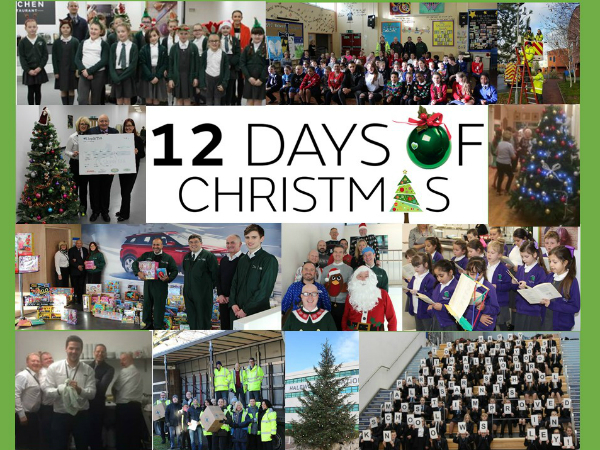 The #12DaysOfChristmas activities have been a huge success, with colleagues across the plant helping others this Christmas period. Here’s a roundup of what’s been going on. Just in case you’ve had your head stuck in an igloo and you’ve missed it all! Our Estates Management Team making a special trip to Alder Hey Children’s Hospital. This year the team have gone the extra mile decorating a large tree at the hospital with hundreds of Christmas lights. They then put up our amazing Christmas Tree outside the plant in time for the start of December. Our Logistics Launch Manager, Eddie Boyes and a team of Halewood volunteers visited Blythswood Care ‏Centre in Speke. The team loaded a large truck with hundreds of shoe boxes from around the country which were packed with gifts and essential items. The shoe boxes have now been distributed to children who live in poverty in other countries in time for Christmas. Many of you also then took part in this year’s Santa Dash. Getting kitted out in your Santa Suits and running to raise money for some great charities. Well done to everyone who took part and a big thank you to those of you who cheered them on along the way. We’ve had two local primary schools in, singing lovely Christmas Carols for us. The children came in to spread the Christmas cheer, singing some beautiful songs whilst raising money for their schools. A big thank you to Yew Tree and Plantation Primary schools for coming in and spreading the Christmas Spirit. Our partner school, All Saints, sent us a very special Christmas message. They are the most improved school in Knowsley and you can see their message on the digital screens around Halewood and on the @JLRHalewood Facebook and Twitter pages. Martin Cunningham and our Paint Shop team coordinated our JLR Halewood Christmas Toy collection for KIND. Thank you to the Halewood Employees Charity Fund for their contribution and also to Joe from Press Shop for even more donations. Thanks to all of you that have donated a toy this year for such a good cause. We also had a group of volunteers take part in the Fairfield Christmas who organise Christmas meals and outings for the elderly community who usually cannot get out during the December period. They worked with other organisations to provide a Christmas meal and entertainment at the Garston Police Club for 50 elderly residents. Our volunteers supported the catering at the event, setting up, serving and clearing up at the end. It was much appreciated by the residents. Then there was Christmas jumper day, many of you got in the Christmas spirit by sporting a festive jumper. Some of you even channelled the big man himself, with beards and hats, hohoho! During December, we gave 12 cheques away to local charities from the Halewood Operations Employees Fund spreading the Christmas Spirit even further. A group from Halewood also spent a day with a fantastic charity ‘An hour for others’, giving out hampers to those who really need it this time of year. Thank you to everyone who took part, Merry Christmas everyone.